The 3000m steeplechase training regime is almost entirely like that of the 5000m and the 1500m events. The areas to work on are speed, endurance and strength. For the better part of 2009, I often met with Ezekiel Kemboi, the four times world champion (2009, 2011, 2013 and 2015) and two times Olympic Champion (the 2004 and 2012), and occasionally joined his group at Kipchoge Keino Stadium and also along the trails around Eldoret, during my training sessions. He used to train mostly in a group of 5000m and 10,000m track athletes that included Sammy Kitwara, and not a day did I see him use any kind of special program for the steeple chase. He went ahead to win a Gold medal at the World Championships that year, and repeated the same in three other consecutive World Championships that followed. Perhaps the only difference between the steeple chase and other middle distance track events is on the agility needed to jump over the barriers efficiently and also on the ability to run at constantly changing pace variations, i.e. slowing down to clear a barrier or a pool of water, then accelerating again before approaching the next one. However, having trained occasionally alongside other great Kenyan steeplechase runners including Jairus Birech and Conseslus Kipruto, it has been interesting to observe that the world’s renowned steeple chasers actually hardly spend time on these drills. Much of their training is really on the running itself. Jumping the barriers is something that is natural and does not require any specialized training. Various articles on the net tend to complicate this natural running event with terms like “low waist line”, turning the feet on your back outwards while jumping over a barrier, landing on the water pit at a certain posture, etc. Actually, it is possible for any athlete who has been training on his speed, strength and endurance, to run a steeple chase competition, without ever having practiced on jumping over the barriers, and win. But, for the 110m or the 400m hurdles, a lot of training may be needed on leaping over the barriers because they are more closer together and one has to get right the number of steps they take before each one. Talking with various 3000m steeple chase athletes here and having witnessed some of them rising to stardom, many of them never had a past experience on jumping the barriers, in fact while selecting athletes to represent some regions in the national competitions in Kenya, it is only on the provincials or the nationals when they are exposed to the barriers, having been running a plain 3000m in the previous stages. The standard barriers for this event are 91.4cm (36 in) tall for men and 76.2cm (30 in) for women. In one lap, an athlete clears five barriers; the fifth barrier being situated in front of a pit of water which is 3.66m long and 70cm deep closer to the barrier and sloping upwards till it meets the surface of the track. Unlike the 400m hurdles, the barriers for this event are firmly fixed such that they do not fall down when hit by an athlete. This is one of the reasons why athletes who would have the talent to do well in this event would prefer to go for other events because of their fear of hitting the barriers and sustaining injuries. At the 1968 Olympic Games, Amos Biwott, of Kenya, amazed the world by leaping over the entire pit of water without putting his foot on top of the barrier! From then on, Kenyans began dominating this event in all the major world championships, most of the time scooping the first 1-2-3 positions. 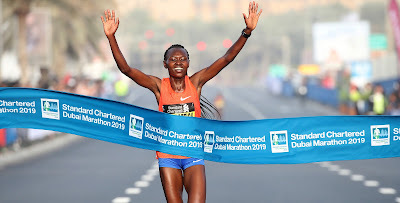 Quatar and Baharain are two other nations that have also recorded some success in this event, only that most of the athletes representing them are Kenyan-born. An example is Stephen Cherono who currently holds the world record of the event after having changed his name and citizenship to Saif Saeed Shaheen of Quatar. Although it is being dominated by Kenyan athletes, the steeple chase event is believed to have had its origin from the British Isles. The women's event only began to feature in major championships from as late as 2005 with Russian and Kenyan women seeming to dominate it.